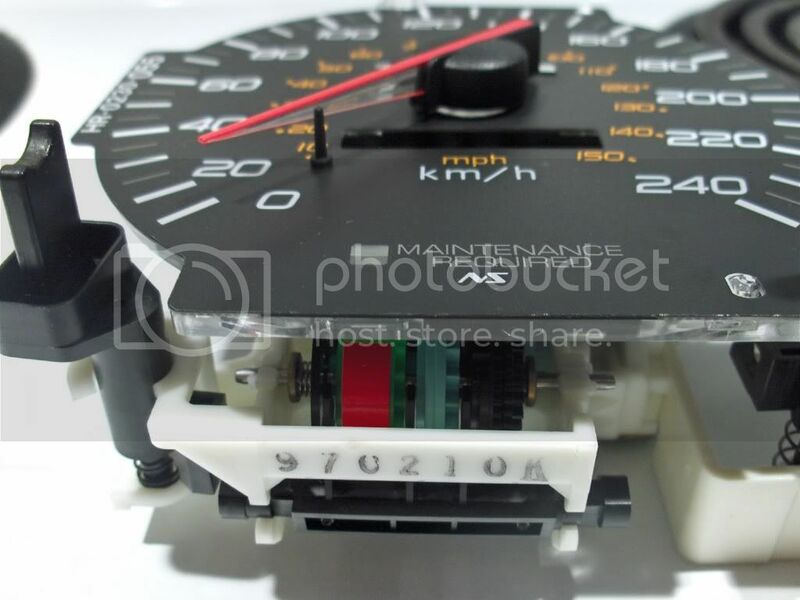 i took my gauge apart to fully illustrate why this isnt really possibly or the extent you would need to go to to change to colour of the auto functions in the cluster as well as the maintenance light. first the maintenance light isnt really a light at all. it uses the backlight of the whole cluster. so why doesnt it change with the backlight. well there is a simple wheel with the three colours (green, red, yellow) on it. it is connected directly to your odometer. as the odometer turns so does the wheel. for this particular function the backlight is actually a front light onto the wheel which is solid plastic with the multi coloured sticker on it. you could conceivably put some kind of transparent plastic between the backlight plast and the gauge face though. odds are though this would probably make it non functional in the sense you wouldnt see the colour change. taking the wheel apart to change the sticker looked very complicated as you would also have to take apart parts of the odometer. next, the auto gear selection lcd and the drive selector. the gear (1,2,3,4) is a standard red lcd display with a clear cover. to change it from red you would need a blue lcd display with the same circuit board layout for the pins. i havent looked but im sure they are out there however, this would be an intermediate to expert mod due to the soldering and component removal. 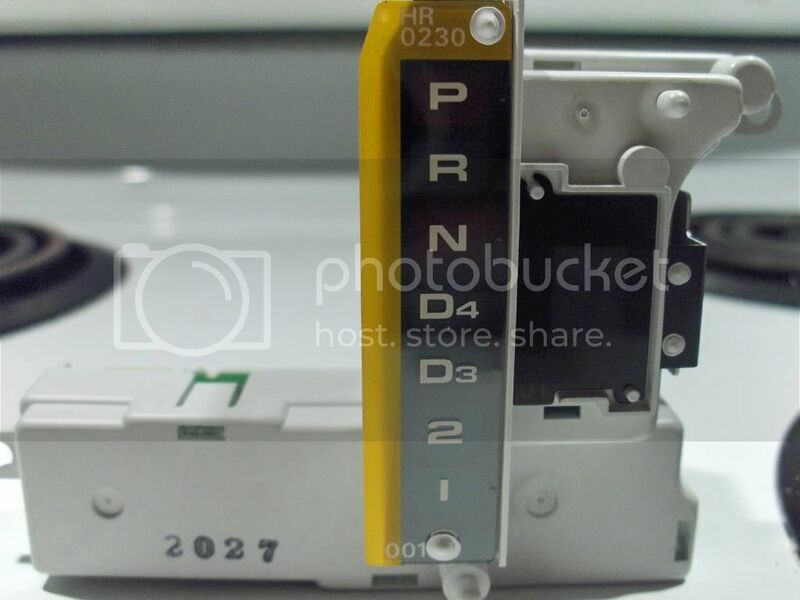 the range selector (p,d,r,n) is bulb run. the backlighting lights up whatever isnt in use and what is in use is lit by one of the bulbs below. these would be replaceable however there is a filter like the ones in the gauge for abs,cel and such. that filter would need to be changed and professionally made or else it would look like crap. even removing it to clear the back of it would most likely damage it due to the way it is affixed. Last edited by Drjless; 04-03-2011 at 02:46 PM. Nice article bro, good ****. Not sure why you would want to change the Service engine light to anything other than red? To each his own but some lights need to be left as is simply for their intended purpose. As for the Drive indicator lights... removing that plastic piece with the letters on it is as simple as grinding down the "head" of the plastic piece holding it on until you get down just to the top of the shaft. Tp put it back together you can do a few simple things but my favorite trick was to take one of my brothers plastic model left overs (the frame all the parts come on) and melt the end of it just to the point it is going to drip. Press it to the tip of the nub you ground off. Once it creates a lil mushroom head you can take your dremel and grind off the stick. If you want to learn how to remove components from a circuit board I can hel you there too. It is easier than you think if you just take your time and have a lil patience. im good on the technique and yes it can be done as said. correct me if im wrong but the drive selector cover looked like coloured plastic, not plastic with a coloured film on the back. the components can be removed yes and if it was an led on a readily available board i would tell anyone to try it. 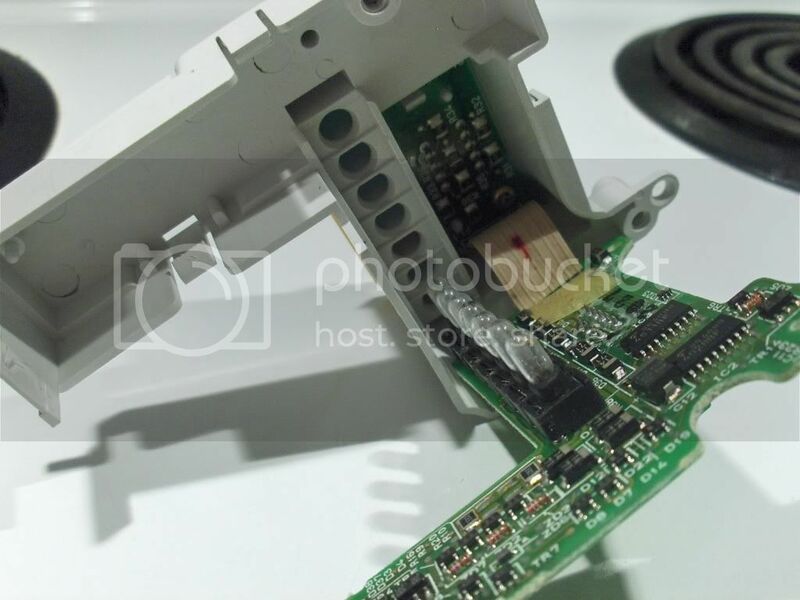 however the led display has 10 pins and a screw up would require a new cluster or parts from a spare which could be costly. i have found what i think to be the correct blue display for the 1,2,3,4 and will give it a whirl and let everyone know how it worked out.